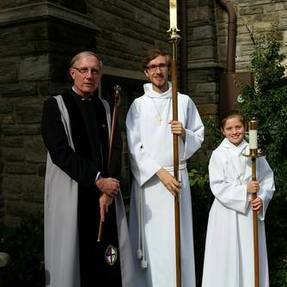 A verger is a member of the laity who works under the direction of their Rector, Interim Rector, or Priest-in-Charge to assist with the organization and operation and logistical details of religious services. Trinity also has a junior verger who will on occasion fill the job of verger during a service. As verger Rich Englebach oversees the lay members of the service: chalice bearers, acolytes, intercessors, lay readers and altar guild. Rich schedules the chalice bearers, intercessors and acolytes. He also trains the chalice bearers while his wife trains the acolytes. As verger he also will fill the role of a chalice bearer or an acolyte. The intercessor's job is to read and lead the Prayers of the People. In the 9:15 service the family of the week greet the congregation as they arrive for the service, hands out bulletins, read the lessons, lead the prayers of the people, collect the offering, and process with the holy elements, offering and donations for St. Mary's Food Cupboard to the altar in preparation for communion. There are currently four trained Lay Eucharistic Ministers who take the holy elements from the congregation to a member of the church who is unable to receive communion in the church building. There is a group of members who volunteer their time to ensure that the weekly offerings are counted and deposited, a ministry very vital to the successful operation of our church. There is always an open invitation to anyone who would like to become a counter. Volunteers are welcome for any of these ministries!